The Church was build early 1200 and was linked to Inchaffray Priory. Local landowners the Rollo family paid for extensive alterations after the reformation. The village of Dunning was burned in 1716 by the Jacobite army but the Church survived. Altered several times over the years the Church has a fine original Romanesque tower and clock. There are fine stained glass windows and an historic graveyard. Rotate the Street view to see the village and nearby on street parking. Entry is free of charge. Of great interest inside is the famous Dupplin Cross. Carved around AD800 to honour Constantine, son of Fergus, he was King of the Picts from AD 789 to AD 820. This is the only complete example of a Pictish Cross to survive. It is nearly 3 metres tall and carved from sandstone. The Cross was originally sited on a hillside overlooking what was the Pictish royal Palace of Forteviot, 3 miles from Dunning. 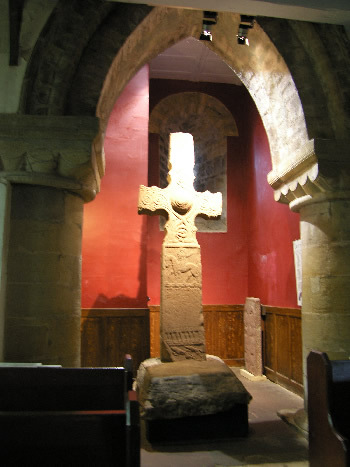 The Dupplin Cross was move dfor conservation reasons to protect the sandstonefrom erosion. The carving on the cross depicts animals and birds, biblical characterssuch as King David, abstaract animals, warriors hunting dogs. It represents a symbol of pwer and prestige of the Pictish Royal family.